Click on the image to download this powerful ad! In advance of the 44th anniversary of the Roe v. Wade and Doe v. Bolton decisions, FFL proudly presents our two new Women Deserve Better® ads. 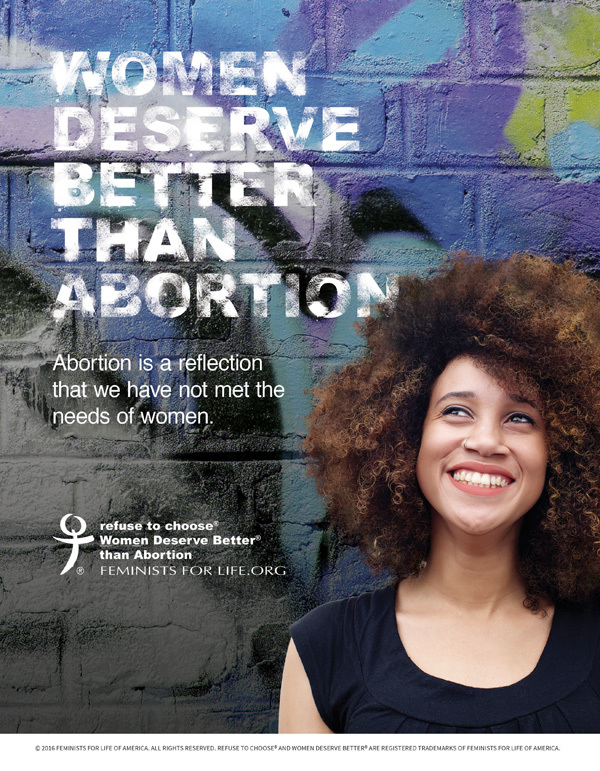 The message “Women Deserve Better® than Abortion” has become a catchphrase that continues to this day. This Sunday, January 22, we pause to remember millions of children we will never know. But we also need to remember Holly Patterson, a teenager who died from complications after taking RU-486; immigrants like Karnamaya Mongar, who was killed by convicted murderer Kermit Gosnell; Christin Gilbert, who had Down syndrome and died after George Tiller performed a third trimester abortion; and hundreds of other teens and women who died from legal but lethal abortion. While pro-life feminists march at events from the Walk for Life West Coast to the March for Life in D.C. and dozens of cities in between, we remember those whom we’ve lost and we embrace those who mourn and regret their decisions to participate in abortion. 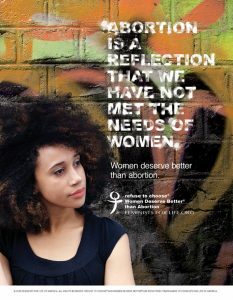 Feminists for Life of America recognizes that abortion is a reflection that we have not met the needs of women. Women deserve better. Therefore, on this solemn anniversary, we rededicate ourselves to work together — despite heated debates and extreme partisanship — to systematically eliminate the root causes that drive women to abortion: a lack of resources and support in schools, workplaces, and communities. We pledge our strategic support to help those who are most affected: those who are poor and low income, victims of violence, college-age and young working women, birthmothers, and disproportionately women of color. They remain the same underserved populations cited by a young attorney, Sarah Weddington, in her oral arguments before Roe. Forty-four years later, one thing is crystal clear: Abortion has solved nothing. Now it’s up to us to find real solutions and make abortion unthinkable. P.S. I encourage you to download and post our ads year-round in your papers and newsletters, on campus, places of worship, women’s centers and pregnancy resource centers, and in your community. Change the conversation by raising expectations! Women must stop settling for less.